Home Best Jumping Media Press Release Alberto Sánchez-Cozar wins first class of CSI2* Guadalajara. Mexican rider Alberto Sánchez-Cozar scored the first victory of the CSI2* Guadalajara 2018, dominating the Two Phases in a time of 29.44 seconds. The class that had the participation of 42 pairs on course designed by Mexican Benjamin Fernandez Gonzalez, only 15 riders would be part of the Two Phases, being led by Alberto Sánchez-Cozar with his 15-year-old mare Wupp Cocoon (Colino x Grosso Z) and marking the only time below the 30 second barrier. Delivering World Ranking points in three classes this week, the home rider Alberto Sánchez-Cozar maintained his good strake of excellent results in the 2017 final part and now he got his first 2018 points, where Mexicans riders was in charge to occupying the first four places. Juan Carlos Álvarez del Castillo followed occupying second place with the 9-year-old mare Puertas Liz in 32.60 seconds, third place was Hector Caro accompanied by the 13-year-old stallion Craig 3 (Canturo x Contender) in 33.24 seconds and fourth place Salvador Onate with the 11-year-old gelding Chadolan (Chacco-Blue x Widolan) in 33.78 seconds. For the best five classified Colombian rider John Pérez finished in 33.79 seconds with the 17-year-old mare Utopia La Cantera (Irrogando x Notaris), occupying the fifth place. 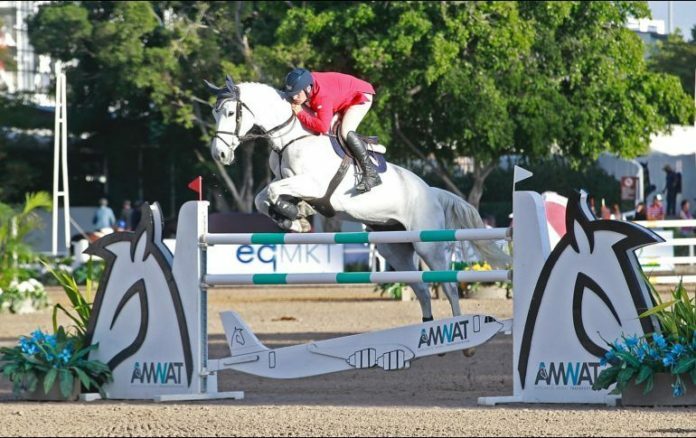 Previous articleEric Lamaze settled on the $35,000 Equinimity WEF Challenge Cup Round Two. Next articleNigel Coupe and Golvers Hill in charge of €25,500 Gulf News Cup.